Datalogic’s mobile linear imager PowerScan PM9100 communicates via short wave radio (433 or 910 MHz) and is the ideal choice for everyone who does not wish to use Bluetooth or WLAN scanners due to possible interferences. 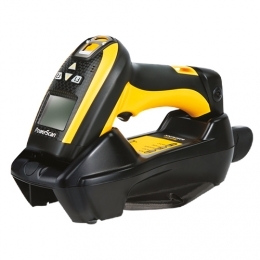 The powerful linear imager captures barcodes with a green-lit line, which is gentle to the eyes and also significantly simplifies targeting. Thus, the PM9100 is a big help in warehousing, production, logistics and transportation. Operate up to 16 scanners simultaneously with seamless roaming per radio receiver. Because the scanner uses Datalogic’s wireless STAR system 2.0, it is also compatible with existing infrastructures and devices based on this system. In addition, it is dust-proof in accordance with IP65, protected against splash water from all directions and from falls up to 2 m. The PM9100 is available in three different versions - in addition to the basic model you get two versions with a display, one of which with 4 buttons and one with a full alphanumeric 16-key panel.